A rock orchestra created by Paul. Originally used for two numbers on the ‘Back To The Egg’ album, ‘The Rockestra Theme’ and ‘So Glad To See You’. 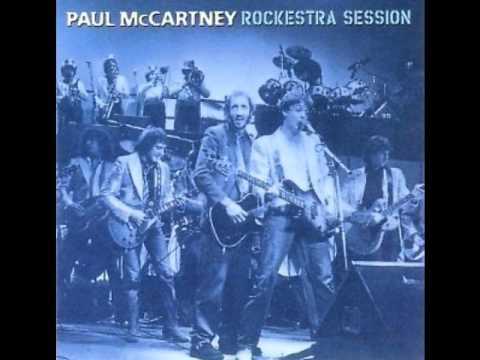 Paul invited a host of noted rock musicians to join Wings and their brass section at Abbey Road Studios on Tuesday October 3 1978 to make the recordings. The line-up of musicians was: Pete Townshend (of the Who), Dave Gilmour (of Pink Floyd), Hank Marvin (of the Shadows), Laurence Juber and Denny Laine on guitars; Ronnie Laine (formerly with the Small Faces), John Paul Jones (of Led Zeppelin) and Bruce Thomas (of Elvis Costello’s Attractions) on bass; Tony Ashton (of Ashton, Gardner & Dyke), Gary Brooker (of Procol Harum) and Linda McCartney on keyboards; John Bonham (of Led Zeppelin), Kenny Jones (of the Small Faces) and Steve Holly on drums; Morris Pert, Speedy Acquaye and Tony Carr on percussion; and Thaddeus Richard, Tony Dorsey, Howie Casey and Steve Howard on brass. During the sessions a special film of the occasion was taken for posterity, intended for showing as a television item. Director Barry Chattington was in charge of the film crew, who were using five 35mm Panavision Cameras. Paul was to edit the 80,000 feet of film taken that day into 5,500 feet, which made a 40-minute film called ‘Rockestra’. However, the film was never released, although a 15-minute excerpt was screened on Monday June 11 at the ‘Back To The Egg’ launch party. The Rockestra was to be gathered together for one special surprise appearance. Dr. Kurt Waldheim, Secretary General of the United Nations had contacted Paul regarding the tragedy in Kampuchea, where millions of people were starving. As a result, ‘The Concerts For The People Of Kampuchea’ were organised at the Hammersmith Odeon, London, in December 1979. 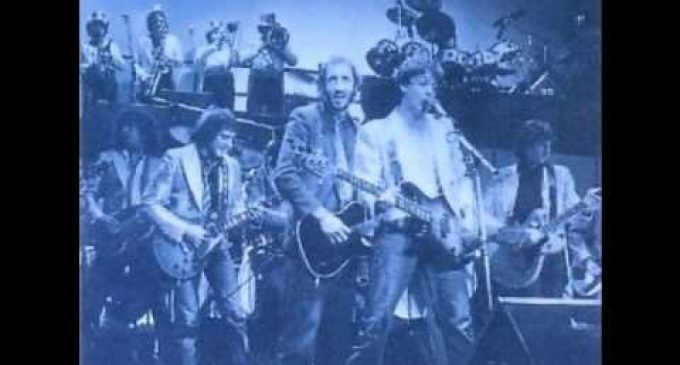 Paul and Wings appeared on the bill on Saturday December 29, with Elvis Costello & the Attractions and Dave Edmunds and Nick Lowe in Rockpile. At the end of the Wings set the Rockestra took to the stage. Musicians included Pete Townshend, Dave Edmunds, James Honeyman-Scott, Billy Bremner, John Bruce Thomas, Gary Brooker, John Bonham, John Paul Jones, Kenny Jones, Bruce Thomas, Rockpile and Robert Plant. They performed ‘The Rockestra Theme’, ‘Lucille’, with Paul on lead vocals. ‘Let It Be’ on which Pete Townshend had an exceptional solo spot and ‘Rockestra Theme’ again. There was much anticipation aroused by the concert due to rumours that persisted that the Beatles would be re-forming for a special appearance that evening. The concerts were filmed for television and were screened in certain ITV regions on Sunday January 4 1981 in ‘Rock For Kampuchea’, an edited version of highlights from the four concerts. There was also an album issued in America on Atlantic K60153 on Monday March 30 1981 and in Britain on Friday April 3 1981 that featured Paul, Wings and the Rockestra, apart from the three Rockestra numbers from the concert, the album included Wings performing ‘Got to Get You Into My Life’, ‘Every Night’ and ‘Coming Up’. Written by: Bill Harry ©2018. All rights reserved. No unauthorised copying or re-publishing of this material is allowed by law. Please contact the writer for re-print permission.